Film adaptation of the Dean R. Koontz novel of the same name follows a clairvoyant short-order cook's terrifying encounter with strangers in his hometown. 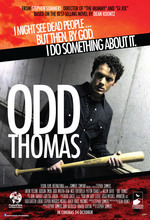 "Odd" Thomas, a twenty-year old short-order cook living in southern California, possesses a distinct ability to contact the dead that sees him working alongside local law enforcement to crack a litany of tough cases. When he uncovers a dark Satanic secret concerning a band of area cops, however, Thomas embarks on his most terrifying quest yet, attempting to defuse a plot to kill most of the townsfolk on the biggest shopping day of the year with ghosts at his side.